I am a teacher. I am a teacher with disabilities. Therefore, I teach (with) disabilities. Stand in a circle. Someone begins by pointing to another person in the circle and saying “ZIP!” That person then points to yet another person and says “ZAP!” That person points to another person and says “ZOP!” This continues, but the words must be said in order: ZIP, ZAP, ZOP. If someone makes a mistake and says a word out of order, that person is out of the game. Instead of putting someone out of the game, make the whole group yell “WRONG!” and point at the one making a mistake. And, once enacted, the Zip Zap Zot activity makes me-the-participant want to run from it, and me-the-teacher want to remake it. Both of these are informed by me-with-dyspraxia, a learning disability in which the brain’s ability to plan sequences – what to do and how to do it – in realms of whole body and fine motor movement. Remaking the exercise would be swift for me – at 57, I’m in my sixth decade of accommodating my own learning needs, and my fourth of adapting this to classroom settings with students. So, three first changes: (1) Likely leaving the group seated in chairs. (2) Certainly entirely omitting the final two lines, substituting something that invites participants to create ways of navigating glitches. (3) Making space for people to opt into partnerships from which to act as zippers, zappers, zotters and pointers. Standing is often not a desirable or possible stance – in a public place, in a given moment, at all. For a low-stakes ice breaker exercise, I wager that more ice is formed by “gotcha” rules than thawed by openly encouraging people to find ways to rework the game’s circuit when factors align in what I’d call a glitch. This is where my life experience with inclusion and universal design kicks in – where’s the room for my blind-from-glaucoma grandfather to play? what would Stephen Hawking do? how do my student and signer team become one of many duo participating in the circle? what would be a struggle for me-with-dyspraxia in this game. Oh, so much: visually tracking other’s movements and words while simultaneously cuing my movement and selecting my words from the prompt queue: zip or zap or zot or zig or zag or zim. Why this scenario and this post? Because I have learned that disability disclosures among peers can provoke collegial conversations and spark pedagogical understandings. Because sometimes what we could point to as a “teachable moment” only comes to make sense for all the the participants when they have moved days and weeks beyond the moment. Re-imagining difference does not remove impairments, but resists how society disables people who have them…. [T]he end of disablement in society requires that we reconceive the way we do politics and education. In phd-school a colleague offered to draw on her skills – as a clinical practitioner and diagnostician working with children and adults experiencing learning disabilities – to help me figure out whether I had been operating for 30 years with a learning disability. Indeed, I had been. In giving me the word dyspraxia, she helped me build research- and reflection-based explanations for my learning struggles, progresses, and processes. Now, as then, understanding that articulatory dyspraxia impacts communication practices – erratic spelling and punctuation with poor proofreading, difficulty sequencing sounds within words and forming words into sentences, trouble controlling breathing and moving air to produce sounds when singing with lyrics, difficulty with speaking some words aloud, and difficulties with learning foreign languages – is something I both confront in my daily life, and something I draw on in interacting with peers and students with disabilities who shape me as a teacher. 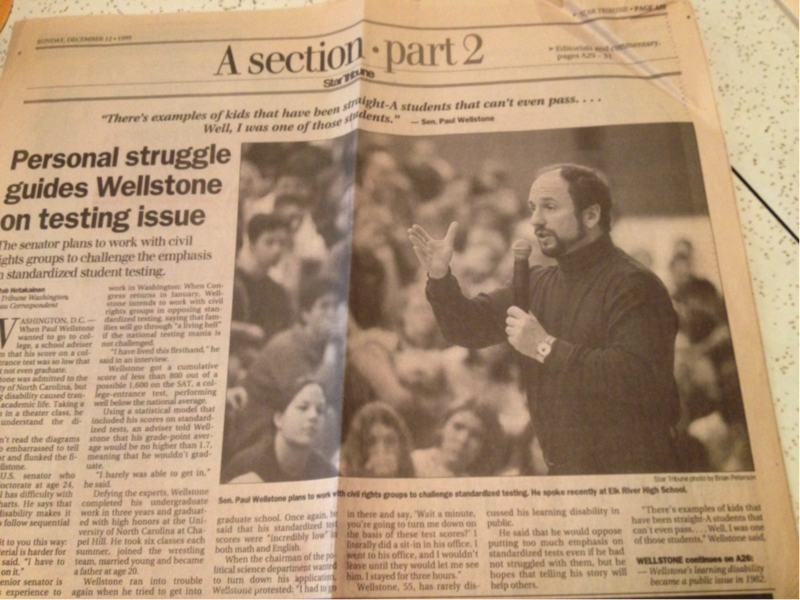 Initially the only public academic I knew to be “out” as teaching with disability was Paul Wellstone, whose dyslexia was something I knew about as a young graduate student, having heard about his difficulties with reading graphs and charts from friends who were his students. Earning a political science PhD while learning new ways to process the chart- and table-based data that troubled his dyslexia is an accomplishment. As was gaining tenure while doing Minnesota-based activism in the 1980s. Becoming a learner required me to adapt to schooling daily, to find my own ways to put into practice what and how I’d learned with my family about learning to learn. Becoming a teacher prompted me to learn from my students about ways to expand, extend, and broaden classroom learning practices so that more students could learn in more ways. Becoming a faculty teaching consultant and teacher of future faculty, prompted me to out myself as dyspraxic, knowing that conversations about learning with disabilities could impact every classroom and every cultural group for people with disabilities are present in all classrooms and in all cultures. Dilemmas are revealed as fundamentally born out of a culture that produces more than one possible ideal world. Social beings are confronted by and deal with dilemmatic situations as conditions of their humanity. It must be possible to think about and to search for various entrances within the same challenge. Pedagogues are not plumbers who immediately need to solve problems. Complexity is the norm and we have to take different options into account. The second ice breaker activity required us to gather in a circle, standing at the center of a large room with tables and chairs at the perimeter, and asked us to take turns moving to the center to generate as many phrases as possible to complete the stem, “I like bears…” At the center, the two further expectations were that people would move into that location, then spin while speaking, until moving back to the outer circle – either because they’d run out of words or because someone else came to take the circle center with a tap on the shoulder. My first instinct was to smile for I do like many bears who identify as part of that gay sub-culture. Then me-with-dyspraxia – who experiences increased loss of motor control under stress – met up with me-with-car-accident-accelerated-arthritis, and wanted to bolt from the room. 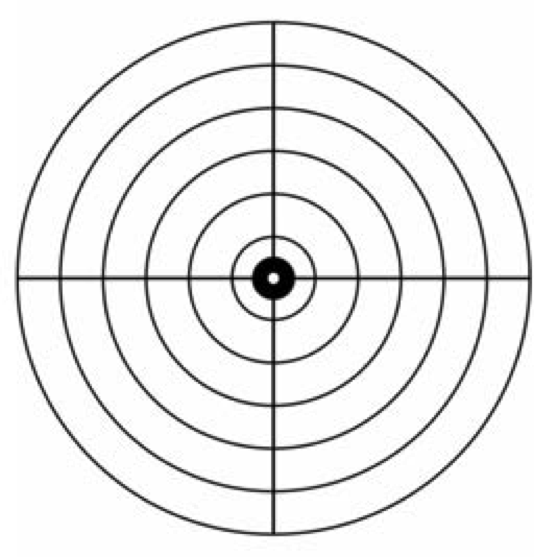 In that bullseye place, I’d be required to be under the gaze of others, to stand for a long period of time, to say words while remembering to move without tripping on my feet or losing orientation to the ground, and to find a way to move into the circle before being called out for not having already ventured there. “What if…” crowded my brain: What if people had come into this space with wheelchairs, with canes for physical support or movement guidance, with guide animals or learning assistants? What if my friends who identify as shy introverts or stutterers or selective mutes or in other ways aphasic speakers were in the room? Those are “What if” moments I’m used to addressing. There are multiple modes for moving into a circle – with one’s own voice from wherever you stand, in the company of another voice that takes on the space with you, with a guiding resource or human assistant you choose. There are ways to expand the speaking space – post its on a wall, lists on a white board or electronic document, drawings on paper or in software – even as the circle with center speakers carries on. The “What if” that was new? What if I do this in the way that work for me, and my colleagues – the one leading the exercise, the ones participating alongside me – react with silence or in what I experience as unsupportive ways? I disclosed my dyspraxia and discomfort. For a long pause, the room was dead silent. A remaining couple of voices took to the center. As we moved from the activities to the day’s retreat activities, the activity initiator walked over for a short, great conversation about pedagogical alternatives. And this was the only conversation I was part of regarding my self-outing as a participant with two invisible disabilities. The dilemma was in four parts: Firstly, how to expand the task so that I could participate in the learning moment. Secondly, whether to disclose as part of a teachable moment, or to just opt to not participate. Thirdly, then as now, how to speak with respect about making a learning while standing at the circle’s edge, the margins. Fourthly, how to link this moment to ways of adapting and expanding learning activities (similar and different) so that more learners can meet intended learning outcomes. Insights for pedagogy emerge when we consider disability as a valuable source of lived experience, rather than see disabled bodies as ‘something to be accommodated.’ When disabled and nondisabled people engage each other, these experiences have the capacity to transform the educational environment. How and why and when do we who teach use disclosure about our own learning lives and practices as pedagogical and motivational tools as we interact with students? Where and why and how do we who work at a public university enact accommodations everyday – in our adaptations to teaching contexts, in our teaching practices as part of Universal Design for Learning, or in course-specific accommodations for the range of learners present during class sessions so that multiple modes of learning are part of our – students’ and teachers’ everyday, ordinary learning experience? In our other campus work and affiliations? How are rooms themselves learning spaces and technologies that we can manipulate to work for us in complex teaching and learning situations? In what ways can we support one another – in terms of sharing resources (assignment swapping) we’ve developed from previous practice, and in terms of sharing workloads (trading off record-keeping chores for courses you teach in common) when a colleague is exhausted from managing simultaneous demands of work, life and disability? How might colleagues in pairs, groups, collaborations support one another in crossing many shared barriers as well as unique hurdles related to the writing and scholarly presentation aspects of research-related work? Simply sharing writing spaces, or communicating about having written, or asking about how another has written out of a writing block, or sharing impressions on testing out assistive software tools that can boost writing productivity – these all help develop, and come to value, other ways of doing scholarly work. How might listening to stories of teachers – and students – with disabilities provoke ideas for changing your practices, for diversifying academic practices overall, and for cultivating our leadership in these and other areas while also quelling that impulse to fix us? My dyspraxia sparked creativity and still sustains it – why would I get over that? I prefer to get on figuring out how to make use of what I learned from an extended paternal family teaching me to write stories when words piled up behind my mouth, from a mother who taught me to type because my penmanship confounded here, from the lovely few early teachers who welcomed a broad range of artifacts as demonstrations of learning, and from the students and colleagues who trust me with their stories of teaching and learning with disability. My mobility challenges are, indeed, often tiring, and they are also teaching me to see others who are tired in conducting basic body work, tired from living in the midst of multiple oppressions, and tired from the privilege shaping the notion of “getting over” something, which comes from a medicalized, individual-as-deviant view of things rather than a social, environmental, cultural view proposes ordinary as complex, multicultural, inclusive. In this combination, I experience disability as “an integral part of one’s embodiment, character, life, and way of relating to the world,…part of the spectrum of human variation” (Anderson). And I experience telling this narrative story as a way to move back into the circle with respect for all who compelled and allowed me to think there. Van Hove, Geert, et al. “Supporting Graduate Students Toward “A Pedagogy Of Hope”: Resisting and Redefining Traditional Notions of Disability.” Review of Disability Studies 8.3 (2012): 45-54. ETTAD (Enabling Teachers and Trainers to improve Accessibility of Adult Education): home page: http://uk.ettad.eu/ , and key resource page: http://uk.ettad.eu/understanding-disability. “This web-based resource aims to enable teachers and trainers to ensure that disabled learners are fully integrated into adult education by advising teachers/trainers and quality assurance staff on inclusive teaching/training and assessment strategies.” Note: The link for searching the site is at the bottom of each page within the site. ← What do first year students want in a college instructor?